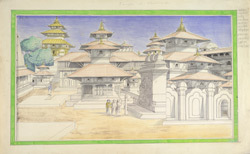 Watercolour drawing of the image of Kala-Bhairava and the northern part of the old royal palace at Kathmandu, part of the Lawrence collection, by an anonymous artist working in the Nepalese school, c. 1843-1846. The image is set within a painted green frame and is inscribed on the front in pencil: 'No. 12', and with the numbers '1-11,' corresponding to nagari inscriptions on the side: '1. Kotilig; 2. Mahadeval; 3. Taleju; 4. Naradeval; 5. Rudradeval; 6. Hathasole; 7. Visnudeval; 8. Baglapur; 9. Kalabhairava; 10. Kundeval; 11. Narandeval. ', and inscribed above: 'Temples at Khatmandu.'. Bhairava is an incarnation of the god Shiva in his terrifying form of the 'Destroyer'. The Kala (black) Bhairava was found in a field during the reign of King Pratap Malla and was installed in its present position by the King, whose image, looking towards his private temple dedicated to the goddess Taleju, is represented on a gilt bronze pillar positioned in front of the god.